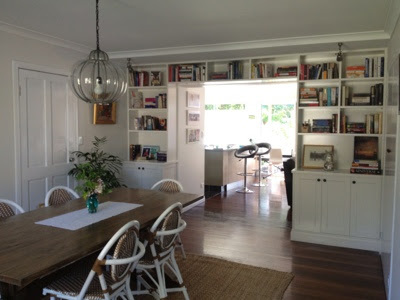 Well the dining room is finally finished. I must admit that it took longer than I thought. Mainly due to my procrastinating when it came to painting. I’m pretty happy with the way it came together and as well as the more expensive items I managed to get some bargains and even some freebies. 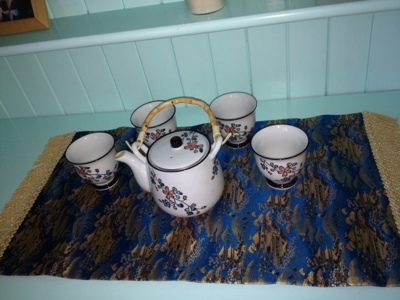 Lovely Belgian vintage table from Collectors Corner. 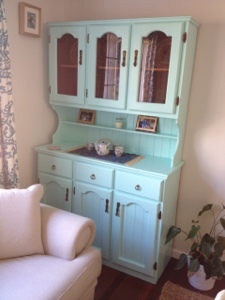 Pine dresser found in shed and painted Chalk Blue. Japanese fabric bought on our honeymoon at Kinkakuji temple, Kyoto. It’s taken me 11 years to find a place to put it! 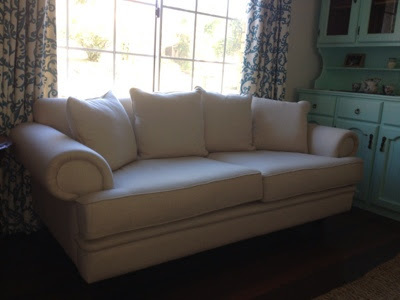 My beautiful new sofa prize from Contempo furniture. 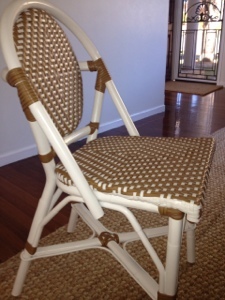 So comfy – thanks Contempo! 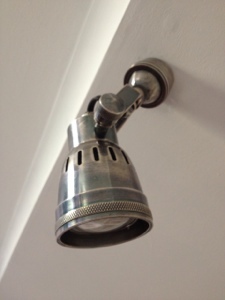 The ready-to-hang curtains were purchased online from Pret-a-Portiere. It was a bit on a gamble buying them unseen but they turned out perfect. 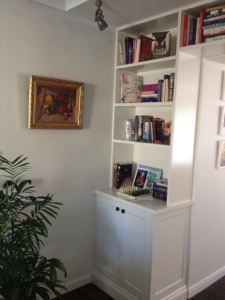 Our lovely bookcases were made by Maytain Cabinets. Not cheap but definitely worth it and it definitely “makes” the room. 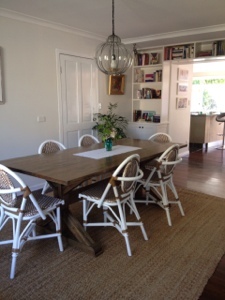 The jute rug, french oak dining table and cafe chairs were all puchased through Porchlight Interiors. 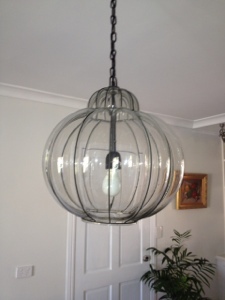 Dining room light from Pottery Barn. 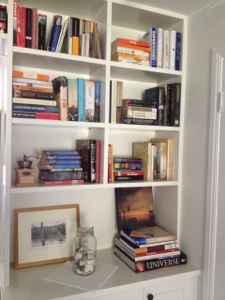 Book case lights from Emac & Lawnton. 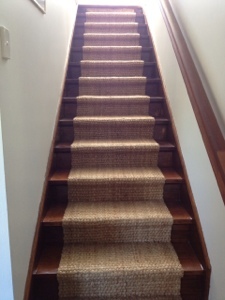 And finally we carpeted the stairs with jute that (almost) matches the rug. This wasn’t so much a design thing but more practically to stop the boys from slipping down the stairs when running around in their socks. Must say though that I’m happy with it now. So the dining room is all done. I’ve taken a few weeks off and recovered. 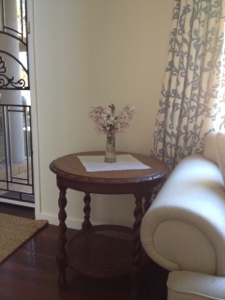 Now it’s onto the boys room…. 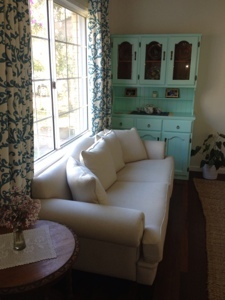 Tina the house looks amazing, and thank you for featuring our drapes.! Is it OK if I link to your blog post from my website? That's fine – and the curtains are gorgeous!